Have piles of DVDs, but have no idea about how to enjoy them on iPod, PSP, iPhone, Zune, Creative Zen, Xbox, Wii, etc; don’t know how to share them on the Youtube, ,myspace, etc; have no way to store the DVD movies on computer or other hard disc. Well, 4Easysoft DVD to Video Converter is especially designed for all the DVD owners. This converter can support all commercial DVDs, including DVD with the restriction of CSS, Region, RCE, Sony ARccOS. And just“Load DVD” button, you can load your DVD from DVD drive, DVD folder in your PC or IFO file. 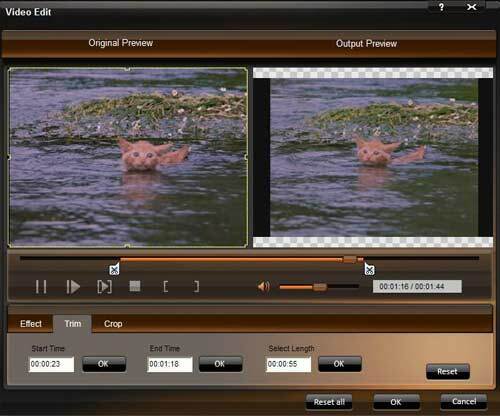 From the profile drop-down list, you can choose the output video format you need. And you can click “Settings” button to set the Video Encoder, Resolution, Frame Rate, Video Bitrate, etc. You can also choose the audio track and subtitle you need. Click “Browse” button, you can select the output path or you can choose the default path of the program. Completely supporting dual core CPU, the conversion can be finished with fastest conversion speed and highest output quality. Click “Effect” button, and a dialogue pops up. You can drag each effect adjustment slider to set the video brightness, contrast, saturation and check deinterlacing for better video quality. Click the “Trim” button, you can set the Start Time and End Time or just drag the slide bar to the position you want and then click “OK” to get any clip you want. If you want to remove the black edges or just convert an area from your movie video, you can click “Crop” button to crop the video of the current title or chapter. 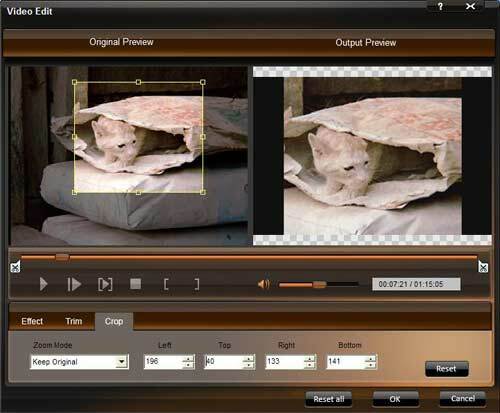 You can specify an area either by dragging the frame around the video; setting the crop values: Top, Button, Left and Right; or selecting a zoom mode from the pull-down menu. 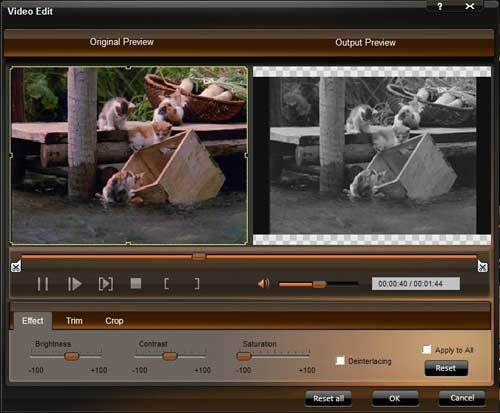 This converter gives you access to snapshot you favourite picture when you preview the DVD videos by clicking the "Snapshot " on the right preview window. Just check the “merge into one file” option if you want to merge the selected contents into one file As default the merged file is named after the first selected file (either a title or a chapter) to enjoy one successive videos by checking "Merge into one file". Click the “Preference” button you can select the output destination, the Snapshot foler, the format of the snapshot image,etc. Just try now! It will not let you down! 4Easysoft DVD to Walkman Converter is specially designed for Sony Walkman users. It can convert DVD to Sony Walkman MP4; rip DVD for any other Sony players; and has more powerful editing functions. 4Easysoft MP4 Converter is a powerful MP4 Video Converter which can convert almost any video formats to MPEG-4 standard formats for Zune, iPod, Apple TV, iPhone, PSP etc; has powerful video editing functions including video cropping, video trimming and video joining; convert other video formats to MP4, AVI, MP3, M4A, AAC,AC3, OGG, WAV, etc.